Sally Manikian starts her mornings unlike most New Englanders. The majority of us wake with things like day care logistics, navigating the morning commute or that 9:30AM meeting on our mind. For Sally, things are a little different. She wakes and she thinks of racing. She thinks of snow flying in the air as it’s kicked up in a hurried pace. She thinks of that biting chill wrapping it’s winter arms around her as she cuts through New England’s beautiful landscape. But of course, she thinks of her pack of four-legged friends that power her morning, and her day. These dogs are her engine, her energy source and her means to go from point A to B.
Sally hold’s a job unique to New England and regions that also find themselves in these northern climates. Sally is a musher. Mushing – defined as a form of sport or transportation where dogs are the source of power, and in most cases, involve pulling a sled or cart on snow – dates back to at least 2000 BC. Exact area of origination is a topic of debate, but it’s without a doubt that many American Indian cultures used dogs to power their supply loads. The sport of mushing is practiced worldwide, but it is primarily concentrated in North America and parts of Northern Europe & the Alps. While training typically begins in late summer/early fall, sled dog races take place during the winter months in cold and snowy conditions, and vary in length from short to medium to long distance. Most notably held is the Iditarod Trail Sled Dog Race – a long distance race held annually in Alaska in early March. During the race, contestants can expect, and will experience, white-out conditions, gale force winds and sub-zero temperatures during their journey. That doesn’t scare mushers away, as more than 50 teams participate annually. In the northern regions of New England, snowmobiles are commonplace – in fact some feel it’s odd if you don’t own one. But, long before the invention of these forms of transportation, there were teams of sled dogs. However, tracing New England’s history of dog sled racing brings us to Nome, Alaska in 1925 where the Great Race of Mercy was held. The 1925 race, or ‘serum run’, was an effort to transport diphtheria serum to the residents of Nome, Alaska, where an imminent outbreak of the fatal disease was about to take place. 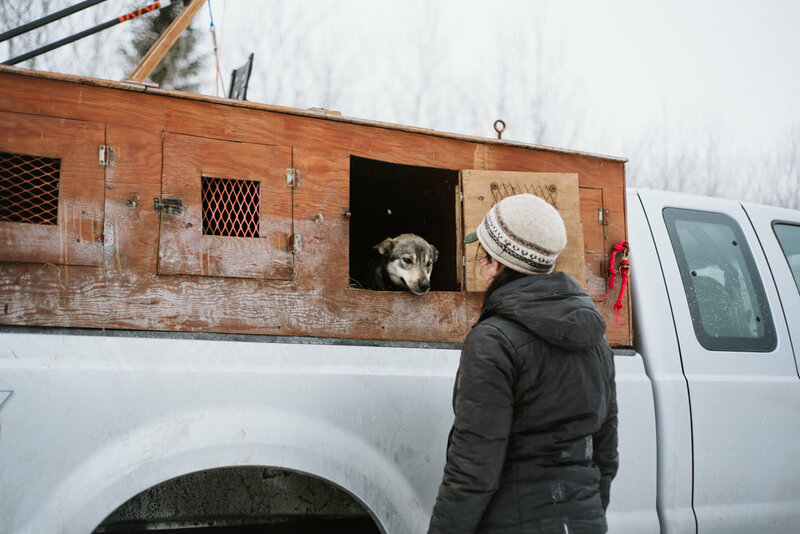 20 mushers and about 150 sled dogs set out on the mission to deliver the medicine. They succeeded, and changed the history of Nome by their accomplishments. One of those mushers was Leonhard Seppala, the final team to arrive in Nome and deliver the serum. Despite all the teams that made it to Nome, Seppala and his team are considered to be the true heroes of the run, having covered the longest and most treacherous leg of the trek. Post Nome, Seppala and his team traveled across the US for team tours. By 1926 they had made it to New Hampshire. Once here, the musher and his team of Siberian huskies ran a number of local races – consistently drawing large crowds – and easily defeating the local Chinook dogs. Seppala eventually sold the majority of his dogs to a kennel in Poland Spring, ME, and it is said that the majority of the huskies found in the US are descendants of one of these dogs. Prior to Seppala’s visit, the New England Sled Dog Club was organized (in 1924), and a handful more followed in the coming years as the sport was embraced with greater reverence and excitement in the region. Today, there are hundreds of mushers in the region – both recreational mushers and seasoned racing teams. It happened by chance. A flier in a coffee shop about guided sled dog tours caught her eye. And the rest seems to have all fallen into place. Sally began her sled dog racing career in 2007 when she took a job as a guide for that same tour company. After years of immersing herself in the job and learning all that she could, Sally felt she was ready to build her own kennel and her own team – she acquired her first four dogs in 2011. Six years later, Sally has a full team of 16 dogs. After spending the morning with Sally, what seemed to be the most interesting fact was that her childhood was spent without dogs. There were cats, and a slew of other animals, but dogs weren’t present. Watching Sally on this morning, interacting with each dog, you would think that she has been a friend of canines all her life. Each dog is cared for and looked after with incredible attention and affection. Sally has gotten to know each dog’s individual personality traits – the characteristics that make them unique and stand out from the pack. Her dogs are shy and outgoing. They are exuberant and relaxed. They are lead dogs, veterans and rookies. Individually, they are unique and stand out on their own. But together they make a unified pack. Together they are an incredible force, with one goal in mind. Shady Pines is a mid-distance team located in Shelburne, New Hampshire at the base of the Mahoosuc Mountains. They are considered small in comparison to other racing teams with a roster of 16 dogs. The team is made up of 6 lead dogs; Bayley, Hyside, Wembley, Ellie, Ia and House. These dogs set the pace and make the trail-running decisions that help guide the rest of the team. The remaining dogs, both rookies and vets, act as the team’s engine. They are the power and driving force behind Sally and her sled. Together, the team runs roughly 2,000 miles annually. When we arrived at the trailhead the morning of our shoot with Sally, we were immediately greeted by Hyside; a tail-wagging, genuinely happy-to-meet-us greeting. As each dog was pulled out of the box attached to the bed of Sally’s truck, they greeted us with barks, sniffs and morning kisses. We observed and photographed Sally as she went about her routine setting up for the day’s run; readying the sled and loading up the gear, putting booties and harnesses on each of the dogs, and lastly, leading them to the gang line. Once they were on the line, their inherent instincts kicked in. An excitement tore through the pack as they howled and jumped with enthusiasm. The team was alive knowing they were about to race. Dogs can’t stay on the trail forever. As racing takes a toll on their bodies, dogs are eventually retired from the team. Despite this, finding happy homes and maintaining meaningful living situations for all her dogs once they are done racing is an integral part of Shady Pines. Their commitment to these dogs is unwavering. All Shady Pines dogs are placed into new homes at no fee, and Sally even offers lifetime dog-sitting for all dogs placed. Creating and providing a supportive environment throughout these dogs’ lives is of utmost importance to Sally. Sally Manikian is an example of a one-of-a-kind New Englander who helps paint a unique portrait of the region. Her story is one of history and centuries-old traditions. Her passion for her sport is inspiring. Sally holds an incredible adoration for her team of dogs, and also for the New England landscape. She wakes at uncommon hours and finds herself subject to some of the region’s harshest weather conditions. And yet, she persists. She has found a deep connection to the animals that she relies on, and also to the remote wilderness that provides her company.